You would never imagine this little restaurant park in heart of Ann Siang HIll was listed on Zagat’s 2013 “10 hottest restaurants in the world” list. Formerly a guerrilla-style underground supper club calledLolla’s Secret Supper, founded in 2008 by Pang Hian Tee, who is the man behind Lolla. The 12-seater counter surrounding the open kitchen is not doubt the best choice for a complete dining experience, where you can watch the dishes cooked and prepared in front of you. The menu includes cold cuts, breads, seafood, eggs, meat and desserts. Its wine list was awarded 'One of the most outstanding restaurant wine lists in the world' by Wine spectator in 2014. The concept here is very simple - the plates are fuss-free, small and tapas in style, made with fresh and seasonal ingredients, infused with mediterranean flair. Most of the dishes comes in tapas portion which is perfect for sharing or even eating alone.Besides the counter seating on the ground floor, there is also a large and a vintage private room for large party of 20+, as well as a cocktail bar. The Sea Urchin Pudding is definitely the most famous dish at Lolla. The pudding was made of squid ink, egg yolk custard (egg yolk and cream) and tomato juice, topped with fresh sea urchin. 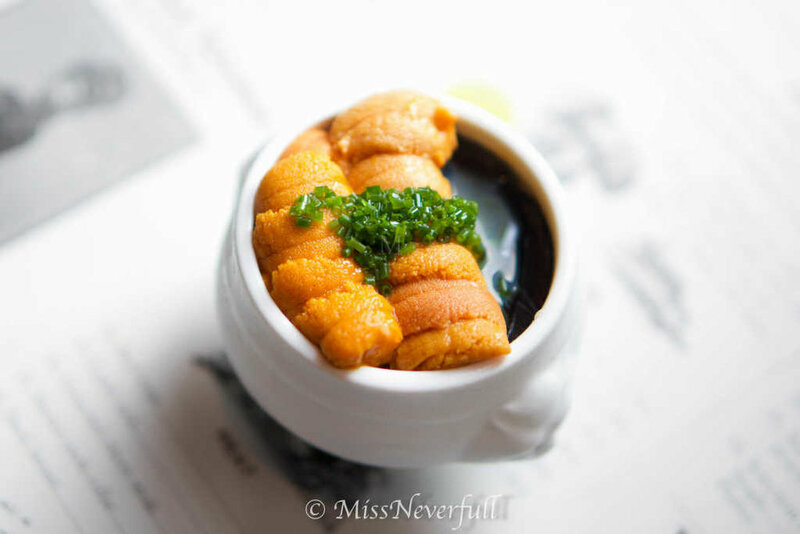 The extremely creamy texture with a deep umami flavor was really enjoyable, the richness of squid ink pudding balanced very well with the refreshing sea urchin. It was deathly delicious - a must order! 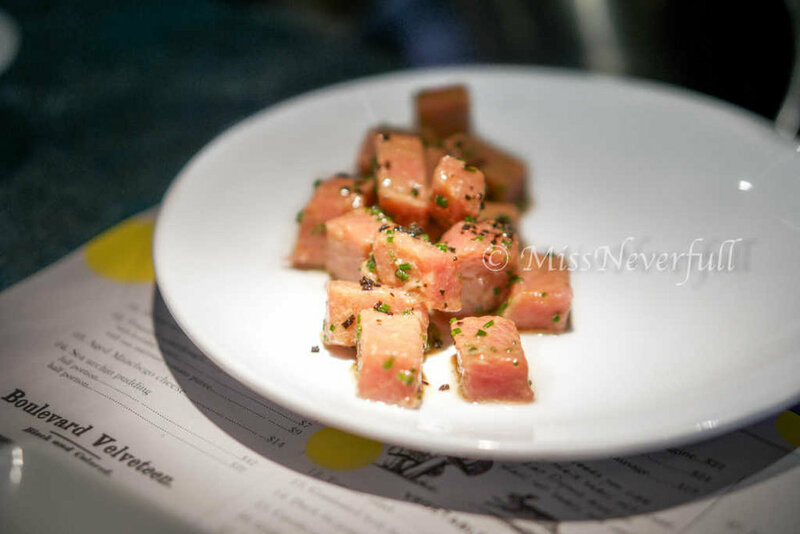 Another highlight of the menu was the Tuna Belly "Chutoro Tartare", we watched the chef cut off the skin of a fresh chutoro fillet, picked the best part, chopped into cubes and mixed it up. The fresh tuna cubes perfectly melted on my tongue and turned into rich oils. The horseradish and lemon dressing balanced very well with the cubed creaminess. Made of Kumamoto tomatoes from Australia, the Tomato salad mixed with extra virgin olive oil, parsley and olive soil was very refreshing and delight. The tomatoes were sweet with a slight sour hint, while the olive soil brought a touch of savory. We picked the Spanish tortilla with Smoke Eel under the 'egg' section. The Spanish Tortilla was basically a Spanish omelette, stuffed with duck fat potato chunks and topped with Belgain smoked eel flakes. The potato chunks nicely added a custardy texture, and the umami eel with a lovely smoky eel was pretty good. While the most disappointing part of the dish was the omelette itself - it was overcooked and a bit dry for our liking, we expected it to be smooth and melting but only the most center part was melting. The best Spanish Tortilla i had so far was from Catalunya. 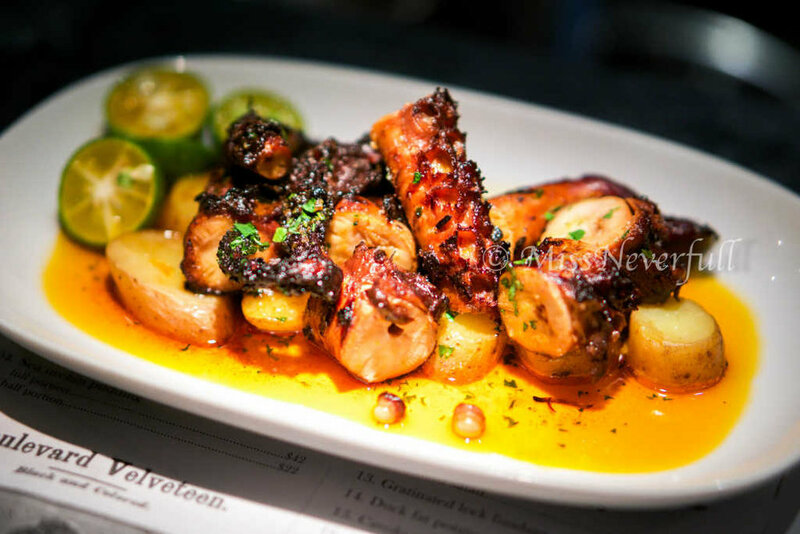 I have to admit that it is very hard to judge an octopus dish because it is very hard to cook, and for most of the time i found grilled octopus is too tough and dry for my liking. Last time having grilled octopus was still at Osteria Mozza, No.45 of Asia's 50 Best Restaurants, and it was so tough to eat. While the one at Lolla was much better than OM's, chewy and very nicely flavored. The two pieces of Lamb Rack with a drooling pink looking were as succulent as it looks. The lamb was very flavorful and balanced well with parsnip puree and yuzu soy sauce. The olive soil again enhanced the flavor, while the kale brought a touch of green to the dish. Desserts should never be missed. Doughnut with Lemon Curd is one of the top-pick on the dessert menu. I am not a big fan of doughnuts, but its fluffiness and lightness somehow changed my view of doughnuts. It was less dense than the normal doughnuts which made me feel less guilty when i eat it, the creamy lemon curd on the side balanced very well. Treat yourself with such a pleasant meal after a tiring day of work is essential, whereas the ambiance can makes you totally relax. The friendly stuffs make you feel like eating at home. Most of the dishes we tried were beautiful, except the Spanish Tortilla which was quite disappointing. We loved the Sea Urchin Pudding and Chutoro Tartare the most. In general it was a lovely one, i don't mind to go back again.